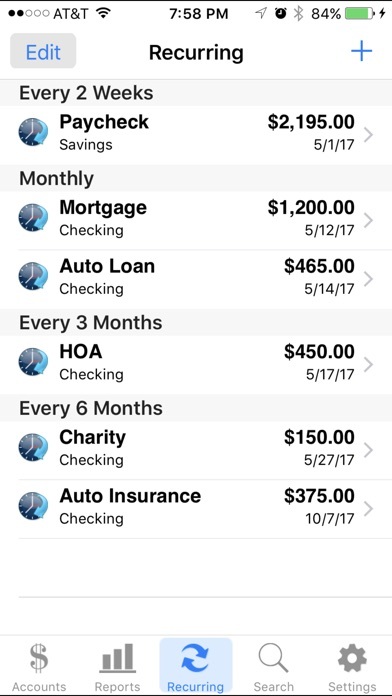 Top Selling Checkbook App Featured by Apple in "What's Hot" List Accounts 2 is an easy to use application to replace your paper checkbook. With the Accounts 2 application, you will have a quicker and more convenient way to track your daily finances. You can schedule transactions, transfer funds, capture photo receipts, reconcile, view reports, export data, print, and much more. 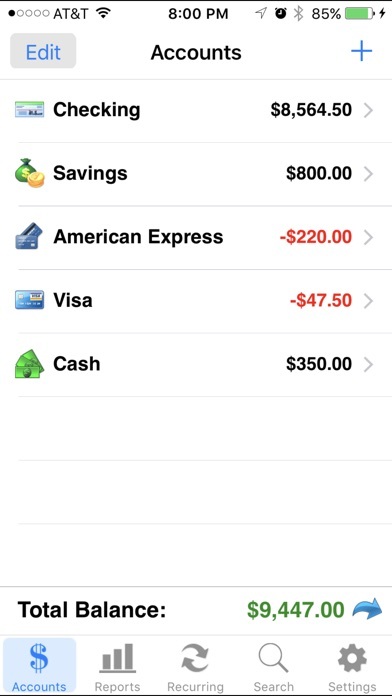 All features of the Accounts 2 app are designed to be quick, clean, intuitive, and easy to use. * If you like this app, then please support us with a positive rating. Thank you! FEATURES * Touch and Face ID Support - Use Touch or Face ID to authenticate and launch the app quicker and more conveniently. * Sync Data via iCloud - Sync your data across iPhone, iPad, and iPod Touch devices * Universal Binary - Designed for iPhone, iPod Touch, and iPad devices. No need to buy separate apps for each device. 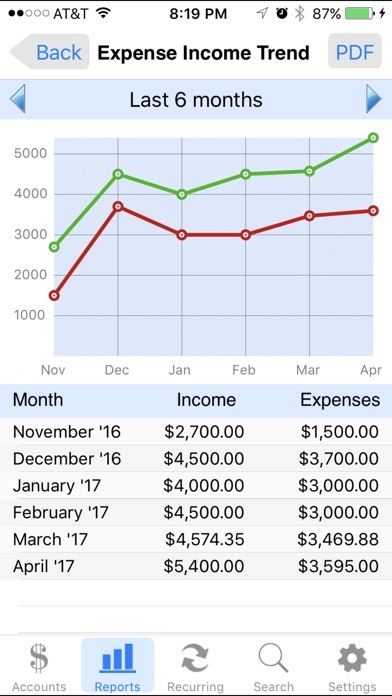 * Graphs and Reports - Review your monthly income vs. expense, spending by category, or income by category summaries with beautiful graphs and reports. * Photo Receipts - Capture and store photo receipt as part of a transaction. * AirPrint Support - Print reports directly from your iPhone or iPad to any AirPrint-enabled printer. * Recurring Transactions - Schedule transactions to repeat weekly, biweekly, monthly, semimonthly, quarterly, biannually, or yearly on a start date that you choose. * Split Transactions - Split a transaction among several categories for more precise tracking. * Search - Quickly search for transactions and edit them from the same screen. * Reconcile Transactions - Reconcile by checking off cleared transactions and comparing the actual and outstanding balances against a bank statement. Accounts 2 now includes a running total for even easier reconciliation. * Smart Autocomplete - As you type, a list will show you your previously entered descriptions and corresponding category. Selecting an entry from the list will fill both fields of the transaction. * Auto-increment Check # Field - Accounts 2 will suggest the next check number for you based on the previously entered number. If you replace your checkbook, just enter the new starting number and Accounts 2 will auto-increment from there. * Transfers - Make a one-time transfer between accounts or set up recurring transfers to automatically repeat. * Export in CSV, QIF & HTML Formats - Export transactions via email attachments for used with desktop applications such Numbers, Excel, or MS Money. * Customization Settings & Themes - Configurable settings and themes to customize the Accounts 2 application based on your preferences. * Transaction Sorting/Hiding - Sort transactions by date in either ascending or descending order. You can also hide reconciled transactions to keep your current list from being cluttered. * Accounts Reordering - Reorder your accounts from the account list in any order you choose. * Accounts Delete Lock Prevents accidental deletion of all the transactions under an account. * Backup / Restore Backup your data for safekeeping via email, Dropbox, or iTunes file sharing interface. Then restore it to your device whenever you need to. * Passcode Security - Keep your accounts information private. * FREE Accounts 2 Lite version - Please download the Accounts 2 Lite version to try before you buy. The App needs to be updated. I’ve not used other Apps, but in comparison to a manual checkbook the one thing I noticed that’s hard to do in this App is to set up recurring transfers and payments that coincide with real life, rather than a fixed date on the calendar. For example: I get paid bi-monthly and the last business day of the month may not always be the 30, and in longer months it’s the 31, which causes timing issues. What if I got paid every other Friday? Need more options in the recurrence section. Items can be edited, but that kinda defeats the purpose of automation. Also have noticed that for reoccurring payments, after they have happened they revert back to 12 am and I manually have to change this every two weeks. I will say that it’s much easier to balance than a manual checkbook and that’s a huge plus. I post older transactions frequently and having to reset the date every transaction is terribly annoying. I’ve had the paid version of this app for the last year or 2. I use a pin code to log in & when I opened the app today all my accounts & settings were gone! The app was on the default settings & view like when you first install it. There’s no feature to write to the creator about bugs or errors. Why did this happen? I know my phone wasn’t hacked. I have been using this app for over a year, Loved it!! I am having problems with it this week. Freeze up, first on my iPad, now on my iPhone. Can’t find anyway to fix it! I have no way to ask for help. PLEASE FOR THE LOVE OF GOD HELP ME! I really want this app to work for me. We can back up and restore from dropbox. Because it won’t sync each time the back up simply overwrites the transactions from one device to the other. Can anyone share if they got the sync feature to work on iOS 12.2? I upgraded enabled family sharing. I activated iCloud drive. I uploaded 2account from the primary device. The problem is I cannot download database from the iCloud to the Secondary device. Enable synch is not working. Unless there is a fix, I do not recommend this app if you have more than one user. I want to reach tech support! 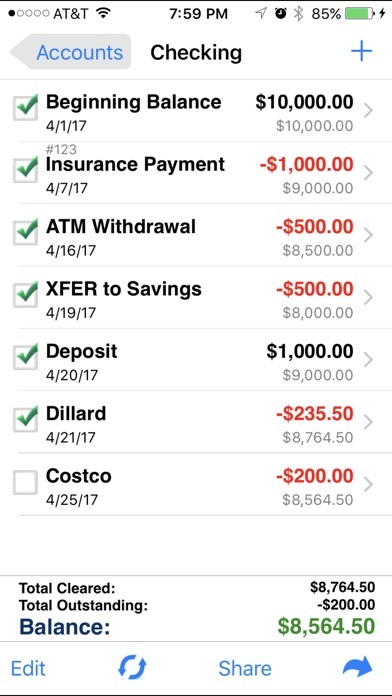 The app is not counting my deposits as income and therefore the reports are a mess and completely inaccurate. 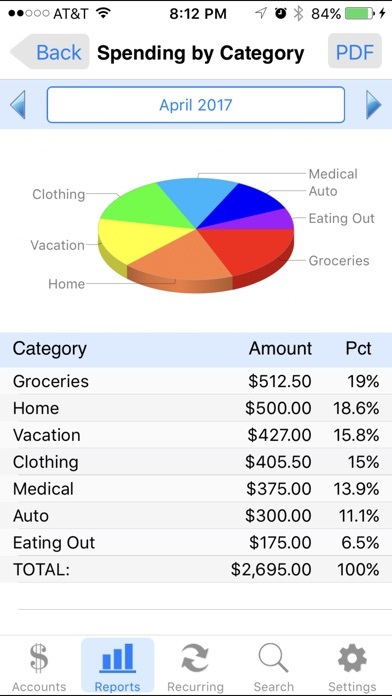 I use the metrics this app provides to inform my financial decision making. Without proper data the app in next to useless for my intended purposes. I’ve been using this app for years. It is simple and does exactly what I wanted! I tried multiple apps and after I downloaded this one I haven’t tried another. Highly recommend! The only thing it’s missing is a way to show Pending Transactions. Add this and I’ll upgrade to a 5. Also add the ability to move Approved Transactions below Unapproved Transactions. Otherwise it’s great. I’ve only used this for a month but at this point I am quite happy with it. I do wish it were possible to print from the register page and that each account could have separate categories. But, those things don’t negate the seamless way this works. I love this app. The only thing that would make it better is a tab for budgets that updates when you enter a transaction.